" Anyone who isn't afraid of the dark, has never seen the things that live there." 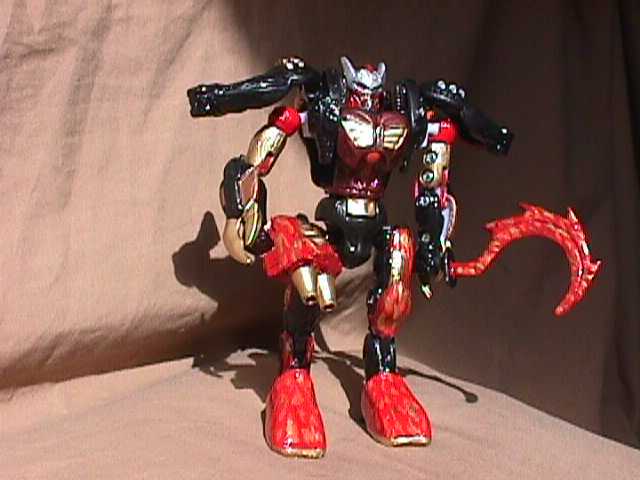 It is in the dead of night that the Maximals often hear the sound of Ghost Rider's hooves thundering across the Beast Wars planet. This sound has panicked more than one of their night sentries, almost as much as the sight of Ghost Rider himself. His fiery form is constructed to cause the maximum amount of fear in any who oppose him. Ghost Rider doesn't mind this, in fact he loves it as he likes to think he can taste his opponents fear in the air. So he does everything he can to broaden and lengthen the 'flavors' of this fear. In beast mode, he resembles an all black horse, but has patches of illusionary fire around his legs, the tail , and where the mane should be. He can run at fairly high speeds, a device in his hooves can enhance the sound of his hoof beats to near deafening levels, and his kick can do a devastating amount of damage. In robot and nightmare mode, his left shoulder has a tri-barreled 'dart' missile launcher, which despite their size can do a surprising amount of damage. 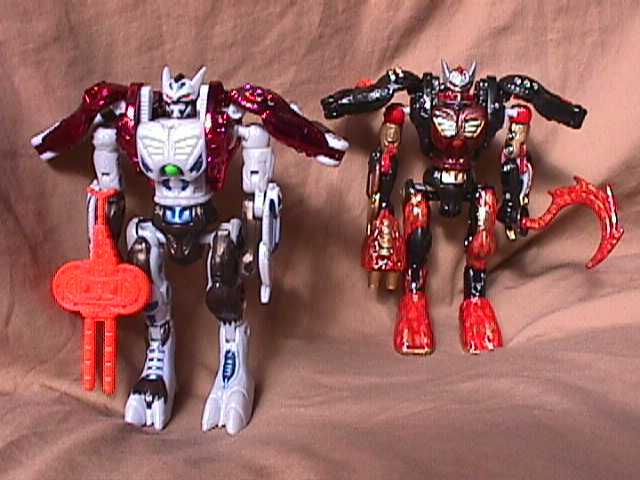 In robot mode he uses a twin pulse cannon, and his tail becomes a curved 'firebrand' style sword. Ghost Rider's tendency to prolong his victims life in order to sample the many different 'flavors' of their fear. 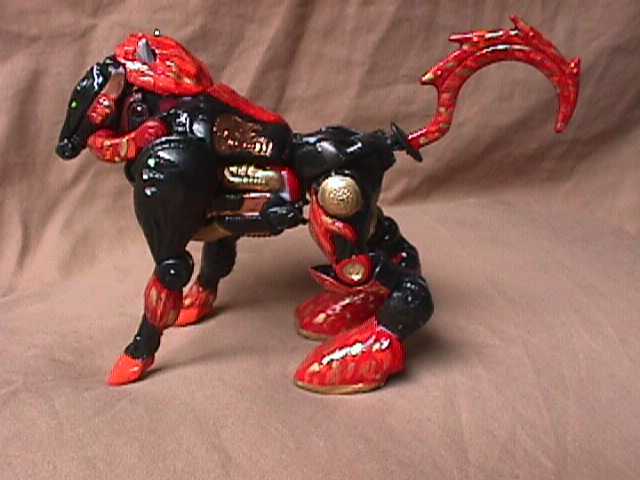 (An ability that his fellow Predacons are not even sure he actually possesses.) This can give the victim a chance to overcome their fear and turn on him unexpectedly, or call for reinforcements, leaving him badly outgunned.